Ask fellow campers about "Beatty RV Park" and nearby attractions. The park is small and located outside Beatty. The park is all gravel with fences making off the sites. It has an odd layout in that some of the sites are pull through if you are first and then behind is a pull in site. If you try to back in the services are on the wrong side. Being in the back of one of these sites makes in hard to disconnect from a fifth wheel or trailer. All the sites are level and the services worked fine. We camped at Beatty RV Park in a Fifth Wheel. Easy to get in/out off US-95. Entire park is gravel. Dual sites are pull thru until one side is full then the other end becomes back-in. Utilities worked well. Wifi was not reliable. Verizon hotspot worked well. Restroom and laundry are fine. Good place to stop over night or two. Good price for full hookup. We camped at Beatty RV Park in a Fifth Wheel. Clean park and easy to drive in and drive out . RV hookups easily accessible. Spots are level we did not have to disconnect. We stayed two nights. Staff was very helpful with local information. Dog walk area is just outside the park. Every thing in town is within easy walking distance. There is some road noise but had no problem sleeping. We camped at Beatty RV Park in a Motorhome. This is a great park for a one or two night stay. Easy in and out. Level pull through picnic table Friendly hosts with lots of local information. Great open land behind campground for dogs. Some road noise. Would stay here again. We camped at Beatty RV Park in a Fifth Wheel. Friendly camphost. Convenient site next to busy road. We didn't notice any of the noise outside due to our own air conditioner. Very hot weather in mid July. Restrooms are very nice, clean and spacious. Good value for money. 1 night $25. We camped at Beatty RV Park in a Motorhome. Quiet clean park. Easy to drive in and drive out . RV hookups easily accessible. Spots are level we did not have to disconnect. We stayed one night. We camped at Beatty RV Park in a Motorhome. $25 for a pull-through full hookup at the end of the park. Very sweet lady stayed a bit past 7 PM closing to welcome us and show us our spot. Lots of road noise. Desert next door where my dogs could run off-leash. A great value for an overnight. We didn't pay the $10 for internet--the attendant said it wouldn't be too good at our site anyway given our distance from the office. We camped at Beatty RV Park in a Travel Trailer. This rate is at the monthly rate then add electric at .12kwh used. Parking looked a little odd because the sites were all pull through and staggered in the two rows but everyone managed to get their rigs in and out. Sites 1-12 in the front row were of course the easiest to maneuver in and out. Two unisex bathrooms were large and clean and included the showers that had ample hot water and pressure. The laundry room had 3 washers and dryers with $1.50 to wash and 50 cents to dry but that time was not ample so I had to dry the loads twice. While it sits on Hwy 95 heavily used by truckers, the traffic slows down at night and was not very noticeable. There are also wild burros across the highway you can see and hear at all hours. OTA was nonexistent and their wifi was spotty. We were warned about each when making the reservation so we were not blindsided by the lack of those amenities. Both staff members were extremely friendly and helpful. We camped at Beatty RV Park in a Fifth Wheel. Beatty is a small town with little to offer. Two gas stations and one only accepts debit cards. The Family Dollar carries a good supply of cold food in addition to their standard supply of dry goods. That is the only place to buy groceries. Another campground in town advertises a "market" but I didn't find much there. There is a nice local museum with Rhyolite, a deserted gold town, and Death Valley as easy day trips. 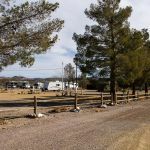 This RV park is the best-kept secret in the Death Valley area. The managers are wonderful. The sites are good and there is a gate from the park right into BLM lands. At night you can hear the burros and coyotes. It's about 3 miles north of the actual town of Beatty--don't be distracted by any of the parks right in town. We camped at Beatty RV Park in a Motorhome. Get candy and cheap gas at the Death Valley Candy Shop in Beatty. Have a good meal at Emma's. Jumping off point to the Triangle Area of Death Valley and 20 minutes to ghost town of Rhyolite. This is very convenient to Death Valley National Park. 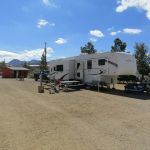 It's nothing fancy but is the best RV park in town. Don't expect the wifi to work at all but our Verizon jetpack worked fine. We camped at Beatty RV Park in a Motorhome. There is a tiny "market" in town but it's very dirty and not worth going to. However, the Family Dollar was very nice. Camp host very friendly, welcoming and accommodating. Facility had everything we needed. Wi-Fi was excellent. We got a kick out of hearing the little braying burros. We camped at Beatty RV Park in a Travel Trailer. Clean, level pull through site with full hookups. Conveniently located water, sewer and electric worked fine. Wi-fi not very dependable. Very friendly manager checked us in, directed us to our site. All gravel, no frills, as are most parks in this part of Nevada. Perfect for an overnight stop except for the traffic noise from highway 95. There is a clean, reasonable laundromat onsite. We camped at Beatty RV Park in a Fifth Wheel. Stayed 3 nights in a 38' motor home while we visited Death Valley NP and rested from long trip. As other reviewers note, this is a very basic graveled park, and has a somewhat awkward parking arrangement, with two rows. The front row has pull thru sites (must drive thru back row to get to them.) Back row noses in very close to the back of the front row, and must back out to leave unless the spot in the front row is vacant. Some permanent residents with relatively neat and clean sites. Staff friendly. Restroom/shower combos were clean. Small laundry room (didn't use) open 24 hours. Game room included library, tv (didn't use), and older pool table. Although traffic moves on the highway, the noise is not too disturbing. Quiet, pleasant stay. Nothing to do in Beatty. Town looks like it is quickly closing down. We camped at Beatty RV Park in a Motorhome. We were met by a very friendly hostess who showed us to our site - great overnight stay. We camped at Beatty RV Park in a Motorhome. Stayed here for an overnight when passing thru. Basic dirt site, but clean. Windy this day, but no problems in the park. Only used the power, but it was very good. Lady in office very nice and parked us. Would stay here again when passing thru. Would have given a higher rating but as previously noted, right alongside Hwy 95 and lots of trucks zooming by. Didn't use any bathrooms or laundry so can't comment on them. We camped at Beatty RV Park in a Motorhome. The town of Beatty is a couple miles from the Park. Easy access to Death Valley and a ghost town. Bring whatever food and supplies you want with you. There is a "market" in town that has a very poor selection in general although they do have some fresh fruits and vegetables. The "Food Mart" convenience store is actually a better choice for everything else. This town does not have much at all for shopping. In fact we could not even find a decent grocery store. They do have a free museum about the area that has some interesting things in it. There is also Ryolite Ghost Town about 7 miles away. About 3.5 miles to town of Beatty, 12 miles to Death Valley National Park entrance, but it's about 40 miles to the main visitor center at Furnace Creek. Beautiful drive, though, with lots to see along the way. Back access to 1000's of BLM acres for 4 wheeling, dogs, motorcycle, horses and hiking. The Rebel gas station has open areas to get diesel that can handle trailers nicely. Are you affiliated with Beatty RV Park ?